They are the industry killers. When Dr. Andy Robinson and Robert Mintak set out to build a lithium producer together, they wanted a world-scale project, and they wanted it fast. That meant no chemical risk, no permit risk, they wanted to be in production ASAP to take advantage of the HUGE profit margins that lithium producers are now enjoying (like, think costs of $2500/ton and pricing of $16,000-$21,000/tON). Dr. Robinson knew every major lithium brine deposit in the world. He also knew the world’s top scientists in getting minerals and salts out of brines cheaply. Mintak is one of the only junior lithium exec to negotiate a deal with Tesla (TSLA-NASD), which he did in his previous company. And now, in less than a year, they have found a lithium-rich brine asset so massive—and already permitted and producing other minerals—that they can be in production before any of their junior peers. Dr. Robinson and Mintak have had their finger on the fast-forward button ever since they joined Standard Lithium—just 10 months ago. They could be the lithium industry killer—producing so much lithium so cheaply and so quickly—that they bankrupt everyone else’s dreams, and send all the lithium juniors (and I mean there are dozens) home to bed. Because not only do they have big land packages, permits, partners and now buckets of cash–they will also be able to produce lithium in 72 hours from their raw brine. Contrast that to everyone else’s assets in the Lithium Triangle on the Chile-Argentine border–where it’s a year to build brine ponds and another 18 months for lithium to concentrate via evaporation. 72 hours vs. 18 months. There’s a no-brainer. It’s a home-grown asset too—smack dab in the middle of the United States; right under everyone’s noses. And would you believe that all their talent, experience, their scientific team—and now their industry killing production asset—is all in one small, $2 stock. It’s Standard Lithium, SLL-TSXv; STLHF-PINK. I bet you’ve never heard of the Smackover Formation. 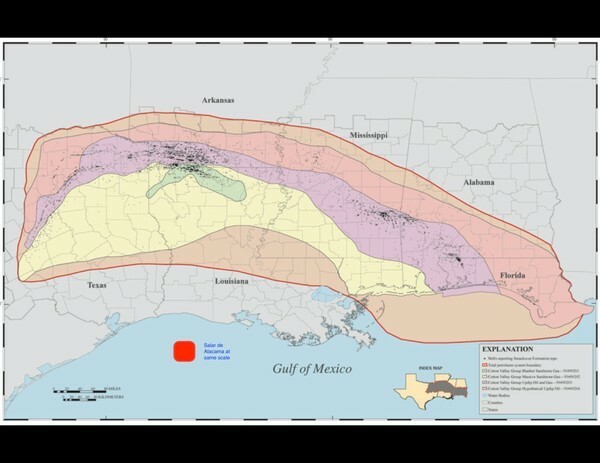 But it is one of the largest underground salty aquifers in the world, stretching from the Gulf of Mexico, up through Texas and Louisiana all the way up into Arkansas. And now it’s going to be a big energy producer; soon to be providing enough lithium to help power millions of Electric Vehicles. Other mineral producers are now pulling up over 350,000 barrels a day of Smackover brine in single operations. It’s bigger than the Permian. It’s MUCH bigger than the Bakken. But those other operators in the Smackover are after calcium chloride and bromine—not lithium. Here’s how I think the lithium brine story will develop in 2018: There are several groups now actively trying to extract lithium from oily, salty brines in North America. Right now these brines produce many kinds of salts, and the lithium is an afterthought. It’s like when Edison invented the lightbulb, or when Gutenberg made the first printing press, or when Daimler patented the first internal combustion engine–many groups were working on each of those inventions at the time, building off previous advancements. The lithium industry is just tweaking current technology to extract the massive amounts of lithium in these brines. It’s a natural evolution…and Standard Lithium has the best and biggest team, with the most money, and an asset and partners ready to go. I think that when Dr. Robinson and Mintak announce their 72 hour flow sheet in late Q3 2018–that will be to lithium what shale was to oil. The Biggest Game Changer Ever. That’s what I mean when I say…the lithium industry is about to get Smacked. Standard’s deal in the Smackover covers a huge 33,000 acres. It would take years and millions of dollars to assemble that land package now. Just the Arkansas part of Smackover produced 250 million barrels of brine in 2013. And historical testing shows a very high raw grade of 350 mg/L. Which lithium producer is the winner in that scenario? Standard Lithium. High grade, infrastructure in place and 72 hour processing will make them one of, if not THE low cost producer of lithium in the world.. The low-cost producer in any commodity market always wins. There’s more–the timing here is perfect for a US asset. Just last month, US President Trump signed an executive order to streamline the leasing and permitting process for minerals deemed critical to the country—and lithium was on that list. Of course, if you’re not a low-cost producer, that will only go so far. But when you don’t spend 3 years and tens of millions of dollars assembling a land package and negotiating permits—when all you have to do is bolt-on a lithium extraction plant—your costs can be very low. Arkansas is such the perfect place for this operation—local colleges actually have courses on how to be an operator in a brine facility. I am not making this up. That’s how much brine processing is part of the culture there. And Arkansas is a very low cost centre for business. Standard Lithium has MANY near-term catalysts that will increase the company’s audience. As you can see, there is a lot happening. I’ve been watching lithium juniors—hardrock and brine—all over the world, ever since I got behind Lithium X at 40 cents in January 2016. …With a huge tailwind from a new US government directive to get all homegrown critical metals developed. Standard Lithium is now funded, with a $20 million bought-deal financing. Partners and properties are in place. In every bull market, one or two stocks get to double digits and become the bellwether stock of their industry. Nobody has a better chance of achieving that than Dr. Andy Robinson, Robert Mintak and Standard Lithium. Disclosure: I’m long Standard Lithium. I think it’s THE lithium stock of 2018. Management at Standard Lithium has reviewed and sponsored this story. The information in this newsletter does not constitute an offer to sell or a solicitation of an offer to buy any securities of a corporation or entity, including U.S. Traded Securities or U.S. Quoted Securities, in the United States or to U.S. Persons. Securities may not be offered or sold in the United States except in compliance with the registration requirements of the Securities Act and applicable U.S. state securities laws or pursuant to an exemption therefrom. Any public offering of securities in the United States may only be made by means of a prospectus containing detailed information about the corporation or entity and its management as well as financial statements. No securities regulatory authority in the United States has either approved or disapproved of the contents of any newsletter.